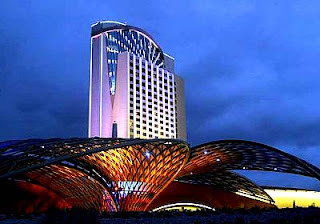 I recently took a trip to the Morongo Casino out in Cabazon, CA. That city, which I had never heard of before is close to Palm Springs. I'm not much of a gambler but wanted to take the wife out there for her birthday, she's not a gambler either so I figured it would be cool since it would be new to both of us. The only other time I had been in a casino was when I was about 16 years old and went to Las Vegas with some other family members. During that Vegas trip, half of the casinos were kicking me out for being underage, the other half were serving me some liquor while I was playing the slot machines. Anyways, on the way to the Morongo we stopped and picked up my mother who loves the casinos. She goes on those buses that take people to casinos about every 3 weeks. She was looking forward to educating us on the slot machines! It didn't take too long to get there, maybe about an hour and fifteen minutes if I remember right, we are only 100 miles away. I'm one who does not like taking long drives but the ride was OK. I know some make hour drives to their jobs everyday, but I don't. I plan to keep my job 20 minutes or less away and I'm OK. When we were almost there you could see the Morongo from the freeway, looks like it's right in front of you but you still have a little ways to go. It is a tall building just standing alone. There was another building that was not tall at all and someone told me that that was the old Morongo building. OK, so how long has this new one been around? I didn't ask much about it. We parked in the parking structure they have there, took the elevator down and when we got out of the elevator you just see all the slot machines everywhere. I was like OK, cool. I didn't plan to spend much money, I took $300.00 for me and my wife to spend on gambling. I didn't figure to win anything so It was money I just had scratched off as a loss. My mom was eager to show us how to use the slot machines and me and my wife still didn't understand much except that you could play pennies, nickels, quarters, dollars and so on. I was looking for the penny machines since I figured my money would last me longer, like I said, I didn't plan on winning anything. The Morongo does not have many penny machines. They did have a couple little sections with penny machines, but the majority I seen were nickel machines. I tried to get a penny machine, but they were all taken up my the other cheap people like me! So we started playing nickel machines and put our five dollar bills in the machines. I lost my five bucks quick but my wife had something good going. At least we thought she did. See how rookie we are at slot machines! She hit something good because her credits starting going up like crazy. When we first put in our $5.00 bills the machines gave us 100 credits. Whatever she hit gave her 1000 credits. We figured cool, she just doubled her money, we thought that she now had $10.00. We ain't going to complain, she doubled her money! Boy, were we wrong here. She kept playing a little more and her credits started going down, they went to around 700 credits so she cashed out and her ticket came out. The ticket said she had $35 and some cents. We were like - what? Little did we understand at the time that when she had 1000 credits that she had $50 in there! Well, now we know how all of this works. Put $5.00 into penny machines and you have 500 credits. Put $5.00 into a nickel machine and you have 100 credits. Put $5.00 into a dollar machine and you have 5 credits. Now it all made sense to me! I also learned a little bit about choosing the number of paylines you want to play and the number of credits wagered per line. Of course the higher you go the more money you can win, also the higher you play the quicker you could lose. So how did the rest of the day go? Before I get to that I want to note how I was so surprised that people could smoke freely in the casinos. I mean, I remember when people would walk through indoor malls smoking, we had smoking sections and non smoking sections in restaurants and other places but now and days a smoker can't smoke anywhere. I seen people playing their slot machines just puffing away so when I first got on my first slot machine I just lit one up right there, felt like the old days. I really feel sorry for people who can't stand the smoke though, they really can't say anything about it. To be fair the casino had a little section that was non smoking. OK, so how did the rest of my new gambling carer go. Well, the first three machines I played I lost $20. We then went to a new section and I turned my $5 into $15 and felt like I won big. Ha, I know it's nothing but I'm not used of free money! I then went to this slot machine that I feel in love with. I put $5 in and I won $45.00, I cashed out and took my $45. I decided to play the same machine a new again with another $5 bill, that $5 bill turned into $40. I was like "alright", this is pretty cool. Again with the same machine I turned $5 into another $40 and then $50. I was thinking to myself, I could see how people can get addicted to gambling. Since this machine was doing good I threw $50 into it and didn't win anything out of that so I gave up on that machine. I felt good though, I was ahead of the casino. I didn't win anything else during the next 4 hours that we were there but when all was said and done I still ended up ahead of the casino. Me and my wife walked in with $300 of gambling money and we walked out with $310 from that gambling money so we actually won $10 for the day. I was happy, seemed like money we should not have had since I expected to lose it all. Overall I give my experience at the Morongo Casino a 'A' rating. I had a good time there and would recommend it to anybody. For more information on the Morongo Casino there website click here.